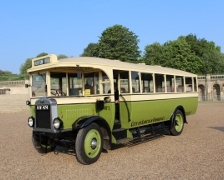 The PLSC Lion proved a winner for Leyland in the few years from 1925 until it was superseded completely by the new Lion LT1, giving reliability and a much livelier performance than most British full sized buses of the time. 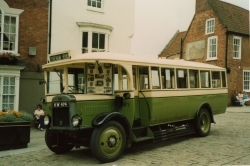 Many PLSC Lions were bodied 'in house' by Leyland, this example entering service with Blythe and Berwick of Bradford. 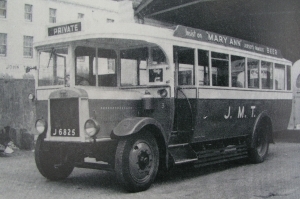 It later passed to the West Yorkshire Road Car Company and finally to Jersey Motor Transport in the late 1930s. 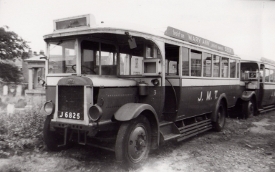 It continued in service until 1959, when JMT modernised their fleet (mainly with ex London Transport RTL type buses). 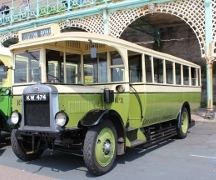 Along with Lancashire United 202, this bus was rescued in 1959 by the LVVS and returned to the mainland. Before the Society acquired its own premises, these buses were stored at the (now demolished) Lincoln Corporation garage on St Marks Street. 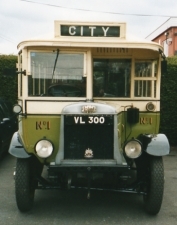 It was restored to the livery of Lincoln Corporation, whose first PLSC, VL300, was an identical vehicle, and the only one of the batch to have a forward entrance. No. 1 under restoration at Lincoln Corporation garage, c. 1960. Mr Jones, LCT manager (left) and Mr LeTall, LVVS founder member (right) discuss details. 'No. 1', after restoration - about to set off on inaugral trip to Skegness. No. 1 at Skegness Pier. A picture of 'No. 1' on the London - Brighton Run in the early 70s can be seen here, courtesy of Mike Morant. An engine overhaul in 2004 was accompanied by repairs to the roof canvas. 'No 1' was a star vehicle at the Leyland 120 event at Leyland in Lancashire on 11 July 2004 - the event organised by the Leyland Society - and was generously transported by low-loader thanks to Benton Brothers and Toby and Pam Evison over that weekend. Lincoln No. 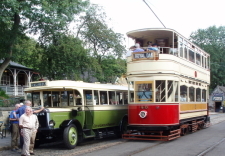 1. with a Blackpool tram at Leyland Society ebent held at Crich Tramway Village, 2008. No. 1 suffered an engine problem while on the road on our Easter Sunday Open Day, but was repaired in time to take part in the 2011 HCVS 50th London to Brighton run over the May Day bank holiday weekend. 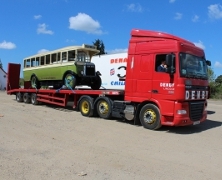 No.1 was transported to and from the event by our friends at Denby Transport. The Society is extremely grateful for all the help and expertise offered by Denby's , without which the appearance at the 50th run would have not been possible. April 2013 - New cast aluminium water jackets have replaced the two rotten originals! These were supplied by the Aire Valley Transport Collection group, to which our sincere thanks are sent. These were machined locally and drilled out for fitting, at the museum.